Q u e s t i o n : There are numerous authentic narrations about the appearance of the Mahdi at the end of time and his putting the world to rights, which will have been corrupted. However, the present time is the time of the group or social collectivity, not of the individual. However great a genius an individual person is, even a hundredfold genius, if he is not the representative of a group and if he does not represent a group’s collective personality, he will be defeated in the face of the collective personality of an opposing group. At this time, however exalted the power of his sainthood, how can he reform the world amid the widespread corruption of a human group such as that? 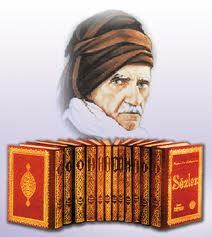 If all the Mahdi’s works are wondrous, it would be contrary to the divine wisdom and laws in the world. 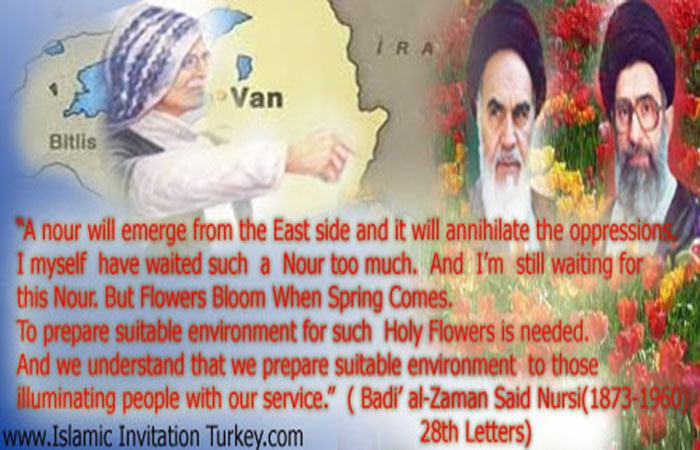 We want to understand the reality of this matter of the Mahdi. How can we? T h e A n s w e r : Out of His perfect mercy, every time the Muslim community has been corrupted, Almighty God has sent a reformer, or a regenerator, or a vicegerent of high standing, or a supreme spiritual pole, or a perfect guide, or blessed persons resembling a Mahdi, as a mark of His protecting the Shari‘a of Islam until eternity; they have removed the corruption, reformed the nation, and preserved Muhammad’s (UWBP) religion. Since His custom has always been thus, certainly at the time of greatest corruption at the end of time He will send a luminous person as both the greatest interpreter of the Law, and the supreme renewer, and ruler, and Mahdi, and guide, and spiritual pole, and that person will be from the Prophet’s (UWBP) Family. Almighty God fills and empties the world between the heavens and earth with clouds, and in an instant stills the storms of the sea, and in an hour in spring creates samples of the summer and in an hour in summer creates a winter storm. Such an All-Powerful One of Glory can also scatter the darkness covering the World of Islam by means of the Mahdi. He has promised this and certainly He will carry out His promise. If considered from the point of view of divine power, it is most easy. And if thought of from the point of view of causes and divine wisdom, it is again so reasonable and necessary that thinkers have asserted that even if it had not been narrated from the Bringer of Sure News (UWBP), it still should be thus. And it will be. It is like this: All praise be to God, the prayer, “O God, grant blessings to our master Muhammad and to the Family of our master Muhammad, as you granted blessings to Abraham and to the Family of Abraham, in all the world; indeed You are worthy of all praise, exalted!,” which is repeated by the Muslim community five times every day in all the obligatory prayers, has self-evidently been accepted. For like the Family of Abraham (Upon whom be peace), the members of Muhammad’s (Upon whom be blessings and peace) Family stand as commanders at the heads of all blessed chains of spiritual authorities in the assemblies of all the regions of the world in all centuries. They are so numerous that their total commanders form a glorious mighty army. If they took on physical form and with their solidarity were formed into a division, if they awakened the religion of Islam and bound it together in unity and established a sort of sacred nationhood, the army of no other nation could withstand them.Thus, that numerous, powerful army is the Family of the Muhammad (Upon whom be blessings and peace), the Mahdi’s most select army. 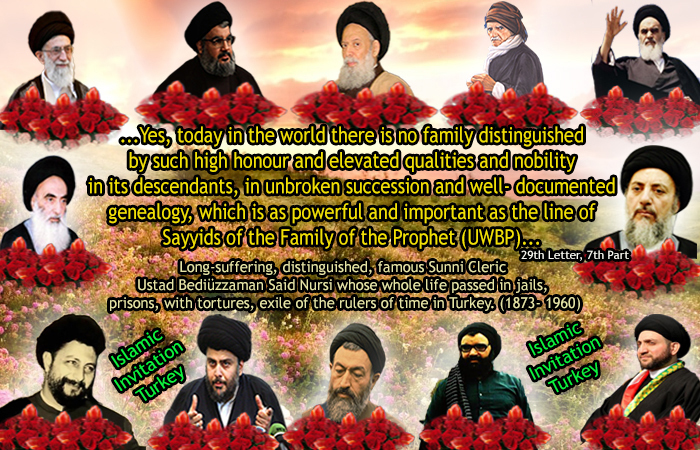 Yes, today in the world there is no family distinguished by such high honour and elevated qualities and nobility in its descendants, in unbroken succession and well- documented genealogy, which is as powerful and important as the line of Sayyids of the Family of the Prophet (UWBP). Since early times it is they who have been at the heads of all the groups of the people of truth, and they who have been the renowned leaders of the people of perfection. Now it is a blessed line whose numbers have exceeded millions. Vigilant and circumspect, their hearts full of faith and love of the Prophet (UWBP), they are distinguished by the honour of their world- renowned lineage. Momentous events shall occur which will awaken and arouse that sacred force within the vast community. 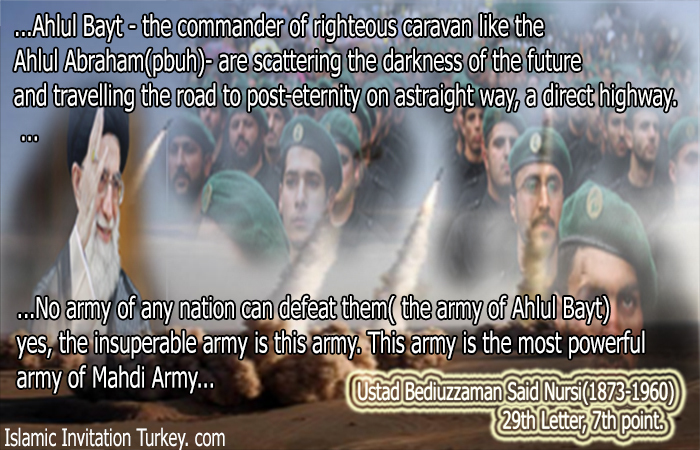 Certainly, the elevated ardour in that huge force will surge up and the Mahdi shall come to lead it, guiding it to the way of truth and reality. We await from the divine law and divine mercy that it should be such, and its being such, like we await the coming of spring after winter; and we are right to await it.